By Nick Ostdick. Dec 14, 2016. 9:00 AM. It’s the first thing you see. It’s the first thing you feel when you pick it up. It often goes a long way toward determining how you feel about it or how you’re going to feel about it once you crack the pages. While we’re talking about book covers in this example, what we’re really talking about is binding: the method in which the front and back cover are fastened over the actual book pages. Because a book’s binding can be decorative as well as pragmatic—helping to protect the book from the elements—it’s often a critical factor in determining a book’s value and worth in the rare book landscape. As a result, novice and seasoned collectors alike should not only place importance on type and condition of a book’s binding, but they should also be somewhat knowledgeable about the different methods of binding and their significance in determining a book’s value. Bindings and binding methods have altered quite drastically throughout the course book making history. This means collectors must possess a wide range of insight when it comes to whether a certain binding is historically accurate, structurally sound, and adds to or detracts from the overall value of the volume. And while the world of bookbinding can be mind-boggling, there are a few tried-and-true elements to look for on the rare book collecting path. With that in mind, here are a handful of important factors to consider when evaluating bindings in rare books. Calf: Calf hide is probably the most common leather-based material used in bookbinding. Its soft texture and little visible grain also make it one of the most sought-after binding methods in rare book collecting. In addition, calf has a versatility that lends itself to be treated in a number of visually interesting ways, such as marbling, which can add depth, complexity, and texture to a book’s cover. Full calf bindings can be seen in the photo of the Physica Sacra volumes above. Morocco: Referring to bindings made from goatskin, morocco has been in use since around the 16th Century and is another highly sought-after method of binding that can significantly add to a book’s value. Much like calf, morocco is a fairly versatile material and takes quite well to the addition of color. For this reason, morocco bindings and covers are often treated with brightly-colored, vibrant dyes. 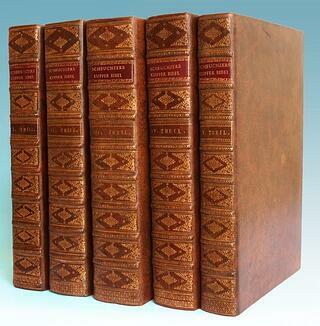 The scarce original publisher's 1/2 Morocco leather binding of Mark Twain's Sketches is pictured at right. Vellum: Vellum was originally made primarily from calf skin; however, more contemporary versions utilize lamb or goat skin. 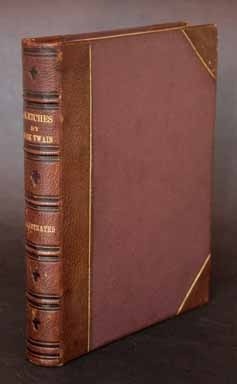 In some respect due to the variances in where the leather comes from, the quality of vellum can vary greatly, and collectors should take that into account when evaluating a book’s binding to determine its overall value. 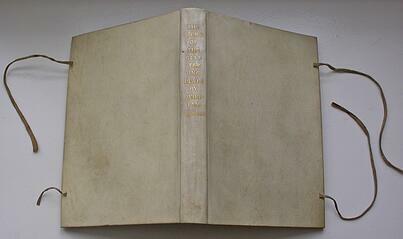 Vellum binding can be seen below in the image of The Story Of The Glittering Plain (1891, Kelmscott Press). Just like anything in the rare book world, methods of binding were subject to evolution as the technology and preference of the reader changed and developed. 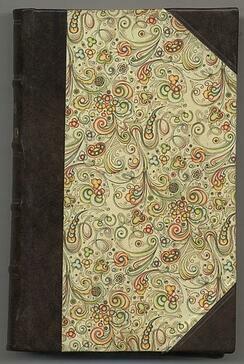 As a result, other bindings have come into favor among collectors, some of which include boards (made from cheap, easily-sourced materials during the 1700s and 1800s and meant primarily for personal libraries); wrappers (similar to boards, though composed of less durable material, usually just a heavy paper); and cloth (which emerged in the 1830s as a viable method of preserving books without having to rebind them, a method that is still popular today). To Rebind Or Not To Rebind? It’s something of a hot-button issue among serious book collectors: how does whether or not a book has been rebound (and in what capacity or method) impact the book’s value and collectibility? The most contemporary school of thought dictates books with their original bindings still in tact are superior to those that undergo a rebinding process; however, there are exceptions to this dictum, particularly if a book has been rebound by a noted bookbinder, which can actually increase the value of the volume, placing more emphasis on the quality of the binding rather than the book itself. Further complicating the issue of rebinding is the fact that it was common practice at one time, especially during the Victorian Era. During this period in book history, books were often rebound to help preserve them for longer use, especially if books were part of private libraries. This means some of the more rare and valuable volumes from this era have been rebound once, twice, or even three times as they were passed down from generation to generation. In addition, this also means books from this or other eras that maintain the original binding materials or ones that have not been rebound stand to be valued at a much greater degree than those that have been rebound or significantly altered. Bottom line: Rebinding is something collectors must evaluate on a case-by-case basis. It’s not a one-size-fits-all hat. There are exceptions. There are special circumstances. While this can make assessing the quality and importance of binding a bit murky, it’s also part of what collectors enjoy when trying to decipher what a book is worth and where to place it in the landscape of rare volumes. It's a good question: Why does binding matter? It matters because, in large part, we're all guilty of violating that old cliche: Never judge a book by its cover. Book collectors are certainly guilty of this folly, but that's not necessarily a bad thing. The artistic impact of a book's cover and binding go a long way toward helping us to decide what we like about a book and why. While there are certainly others factors that come into play when collectors are examining, judging, and determining the value of a book’s binding—overall condition, defects, and a host of others—the kind of material used and whether the book has been rebound are two of the most crucial. Armed with this knowledge, even the most novice book collector will have an important advantage in determining what a book is worth and whether it’s worth the time and money necessary to acquire it.